Formalization is a core structural characteristic of the firm and an important determinant of decision-making efficiency. This empirical paper explores formalization in financial institutions’ product line pruning decisions. The authors develop a set of hypotheses that are empirically tested in a stratified random sample of UK financial institutions. The results demonstrate that the level of formalization in the elimination decision-making process depends on specific organizational and environmental conditions, including overall company strategy, product line length, market orientation, top management attitude toward line pruning, austerity of the regulatory context, and rate of technological change. 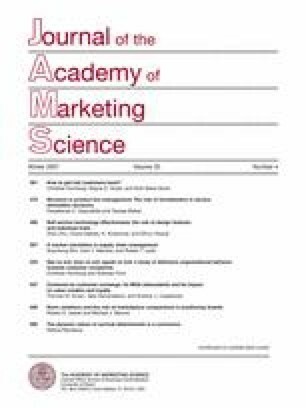 The results also show that formalization enhances the procedural rationality of elimination decisions, and leads to customer-sensitive implementation strategies. This paper is the first attempt to link service elimination decision-making with structural characteristics of organizational decision-making. The results yield important managerial implications and point at useful directions for future research. The authors thank two anonymous JAMS reviewers, the previous Editor George Zinkhan and the new Editor David Stewart, whose constructive comments improved the paper. Categorical question (banks, insurance companies, building societies). Categorical question (cost reduction, slow imitation, fast imitation, technological innovation). Number of financial services in the product line. In our company top management views product line pruning decisions not as important as product line expansion decisions (R). In our company top management treats the elimination process as a strategic and continuous product line management function. In our company discussions about future line pruning plans are perceived as having little usefulness and are discouraged by top management (R). In our company top management treats the service elimination process as an integral part of the product line management activities. Our business objectives are driven primarily by customer satisfaction. We constantly monitor our level of commitment and orientation to serving customers’ needs. Our strategy for competitive advantage is based on our understanding of customers’ needs. Our business strategies are driven by our beliefs about how we can create value to customers. We measure customer satisfaction systematically and frequently. Our sales people regularly share information within our company concerning competitors’ strategies. We rapidly respond to competitive actions that threaten us. Top management regularly discusses competitors’ strengths and strategies. We target customers when we have an opportunity for competitive advantage. Our top managers from every function regularly visit our current and prospective customers. We freely communicate information about our successful and unsuccessful customer experiences across all business functions. All of our business functions are integrated in serving the needs of our target markets. All of our managers understand how everyone in the business can contribute to creating customer value. We give close attention to after-sales service. All of our business functions and departments are responsive to each other’s needs and requests. Competition in our sector is cutthroat. There are many “promotion wars” in our sector. Anything that one competitor can offer, others can match readily. Price competition is a hallmark of our sector. One hears of a new competitive move almost everyday. Our competitors are relatively weak (R). Regulations relating to marketing mix decisions in our sector (service design and characteristics, promotion and advertising, pricing, delivery process and channels of distribution). Regulations concerning the provision of adequate information to existing and new potential customers in our sector. Regulations concerning costs and commission disclosure in our sector. Regulations concerning adherence to best advice and avoidance of mis-selling in our sector. Regulations concerning the obligation on the part of financial institutions to allow customers to assess their safety and soundness. The technology in our sector is changing rapidly. Technological changes provide big opportunities in our sector. It is very difficult to forecast where the technology in our sector will be in the next 2 to 3 years. A large number of ideas for new financial services have been made possible through technological breakthroughs in our sector. Technological developments in our sector are rather minor (R). a: 7-point LRF scale (1: strongly disagree; 7: strongly agree); b: 7-point rating scale (1: not at all; 7: to a great extent); c: 7-point LRF scale (1: strongly disagree; 7: strongly agree); d: 7-point rating scale (1: not austere; 7: extremely austere); e: 7-point LRF scale (1: strongly disagree, 7: strongly agree); (R) indicates a reverse-coded item.